Scientists at the Georgia Institute of Technology have finally explained a mystery that fishermen in the California current of the Pacific Ocean have monitored over the past 70 years. Their discovery has resulted in the naming of a new climate pattern, one called the North Pacific Gyre Oscillation (NPGO). Fluctuations of salinity, nutrients and temperature have been taken by fishermen since 1945, among other things, allowing them to track changes in fish populations such as anchovies and sardines. Having studied these findings, Emanuele Di Lorenzo and his team discovered this new pattern of current. “We’ve been able to explain, for the first time, the changes in salinity, nutrients and chlorophyll that we see in the Northeast Pacific,” said Di Lorenzo, an assistant professor in Georgia Tech’s School of Earth and Atmospheric Sciences. What makes this story even more interesting is its most recent intensifications at the hands of a warming planet. 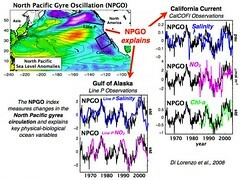 “Although the North Pacific Gyre Oscillation is part of a natural cycle of the climate system, we find evidence suggesting that its amplitude may increase as global warming progresses,” said Di Lorenzo. According to their research they have found that it has increased in intensity over the past few decades. Climate scientists are continually focusing on discovering and understanding the planet’s climate shifts, patterns and changes. More than just trying to understand what is happening, being aware of the whole story helps see what will happen. The more information that goes in to a computer model bent on predicting what will happen to a region, or the planet’s climate, the more chance that the answer will be accurate. The discovery of the NPGO has thus provided just that bit more information for computer models attempting to put a face to the future of our planets climate.